I'm happy to know that weekend is coming and August is ending so fast. I just can't wait for September to come as it is my birth month and i'm excited for some good news. Anyways, today's outfit post is all about denim in denim style. There is a question that divides our view in styling: Should you or shouldn't you double up on your denim? In my own opinion, twice as much as denim is twice as good. In my outfit, I added up a touch of summer print - 'watermelon' to spice it a bit. How to wear all denim and still look chic? * Keep it simple - Less is more, so keep it simple with two denim pieces of clothing in classic cuts. Break it up with basics and neutral accessories. * Accessorize - Stick to a pared down look with versatile accessories. If you want to wear a statement piece, keep it to a single piece of jewelry, shoes, or a bag. * Break it up with prints - as what i did to my outfit post today is that I put a season must have print. * Break it up with a belt - If you’re wearing denim on your top half and bottom half, break up the look with a belt. * Layering - Why not try layering a denim jacket over a denim shirt for something a bit different? 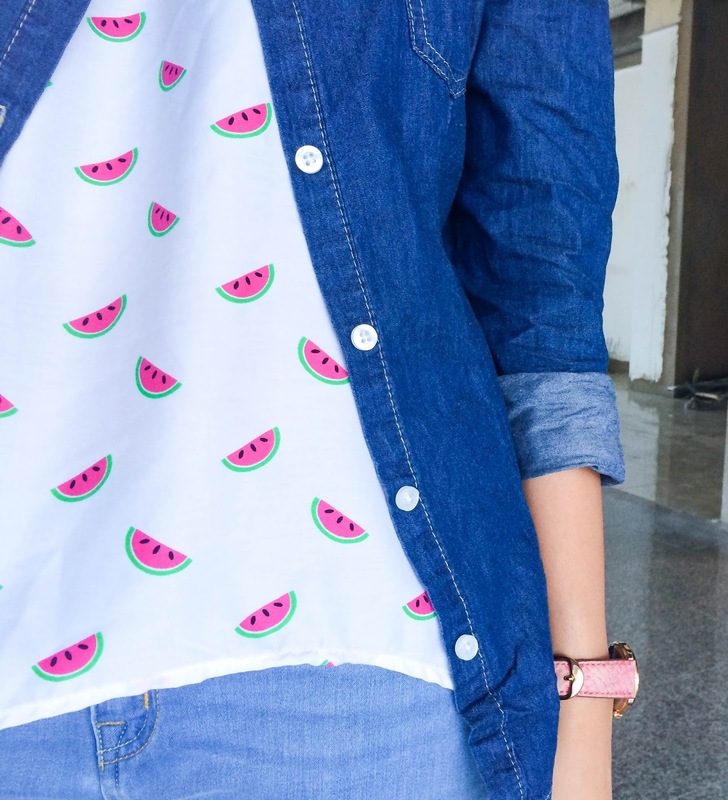 Here are just few of my tips, is there any tips you want to add in wearing denim on denim?